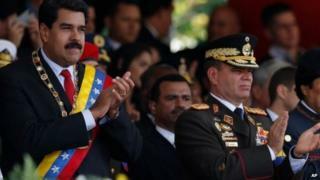 The military in Venezuela has admitted it committed "some excesses" during weeks of political unrest that have left more than 40 people dead. The military's strategic command chief, Vladimir Padrino, said they were investigating 97 officers and police staff for "cruelty and torture". But the general stressed these were less than 1% of all officers. Security forces have been accused of human rights abuse during the almost daily anti-government protests. "We are able to say that 97 (officers) are being investigated by prosecutors for cruelty, for torture," Gen Padrino said. "That represents only 0.4% of the force," he told Venevision television. The protests have left at least 41 people killed and hundreds more injured on both sides. The Venezuelan opposition and human rights activists accuse the security forces of repression and using heavy-handed tactics. But Vladimir Padrino insisted the security forces were acting "in accordance with the rule of law". "No soldiers have received orders to hurt anyone, harass or end the life of a Venezuelan," he said. On Thursday, Venezuelan President Nicolas Maduro met opposition leaders in crisis talks aimed at quelling more than two months of protests. The demonstrations began over high levels of crime, rising inflation and shortages of basic foods, but have since grown into a wide opposition movement. Venezuela remains sharply divided between supporters and opponents of Mr Maduro, who narrowly beat his bitter rival, opposition leader Henrique Capriles to the presidency last year.